Hurricane Florence, which is rapidly approaching the U.S. East Coast, was upgraded to Category 4, indicating that “catastrophic damage will occur.” Its 130 mph winds of destruction will likely hit the Carolinas on Thursday or Friday. It is expected to hover near or over the coast for up to four days, threatening to become the “Harvey of the East Coast,” with intense winds and rainfall. The Outer Banks is already under an evacuation order. Other residents in the path of the storm must prepare for the worst now. That means stocking up on plenty of fresh drinking water, canned food, flashlights, and an energy source like propane, batteries, or even a generator, among other precautions. Store managers are doing their best to keep supplies on the shelf. But in the rush to prepare for the hurricane, it’s easy to forget about our pets, who also require disaster preparation. Roughly 600,000 pets died or were displaced during Hurricane Katrina in 2005, as unprepared families were forced to leave them behind. Thousands more were abandoned in Puerto Rico after Hurricane Maria hit last year. 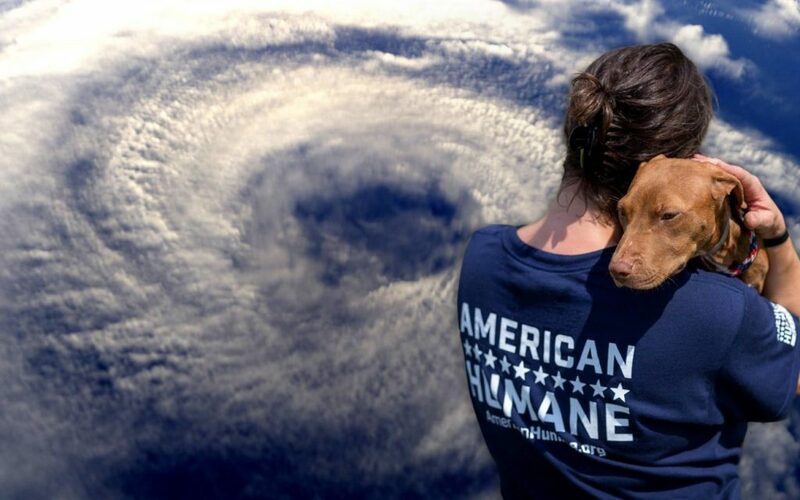 American Humane has deployed to dozens of disaster zones in recent years to aid stranded, injured, and hungry pets, many of whom may have been fine if their owners had followed some key preventative steps. And while our team is preparing to deploy again if needed, pet owners can make navigating a disaster much easier — and more importantly, keep their pets safe — by preparing before harm strikes. Perhaps the most important first step in protecting your pets from a disaster is making sure they have proper identification. At the very least, this means a collar that includes ID tags with legible and up-to-date identification and contact information. But ideally, pet owners should have their pets microchipped, a process where a tiny tracking device is inserted into the animal’s skin, meaning it won’t get lost during a storm. Such identification provisions are the single biggest difference maker in returning lost pets to their owners. According to a study published in the Journal of the American Veterinary Medical Association, less than one-quarter of dogs who enter animal shelters will be reunited with their families. Yet most dogs who are microchipped are successfully returned. See if you can get into your veterinarian today for this quick procedure. It’s also important to know before a storm hits whether your secondary shelter accepts pets. Many hotels don’t allow pets, and your in-laws or friends outside of the disaster zone may be allergic. Contact your vet for a list of recommended boarding facilities, or reach out to your local shelter to ask if they provide emergency shelter for pets. This is information Gillian and Philip Parker, among countless others, could have used when they were fleeing Hurricane Harvey last year and were denied the only hotel room they could find because the manager wouldn’t allow their dogs to stay. Finally, you should have a ready-made pet disaster preparedness kit, which includes the critical supplies and items that your pet will need in an emergency. These should include plenty of canned or sealed food, water, leashes, bowls, waterproof bags, blankets, treats, toys, and any medications they might need. Armed with such a kit, a natural disaster can transform from a pet emergency into a mere nuisance. It’s still too soon to tell just how destructive Hurricane Florence will be. Yet by making these basic preparations, you can ensure your family’s protected, including its four-legged members.